The maker movement took center stage at this year's South by Southwest Interactive Festival in Austin, Texas. 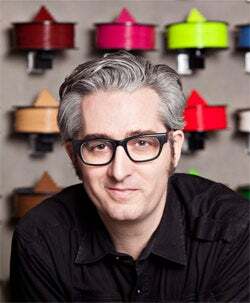 The coveted opening keynote was delivered by Bre Pettis, CEO of 3-D-printer manufacturer MakerBot Industries, who used the occasion to unveil the Digitizer, a desktop device capable of scanning objects up to 8 inches in height using lasers and a webcam, streamlining the printing infrastructure from end to end. "You can fill the world with garden gnomes if you want," Pettis joked. The onstage debut was an homage to Maker-Bot's origins: In early 2009 Pettis was part of a collective of hackers who wanted to get their hands on a 3-D printer, which at the time were the size of mainframe computers and cost about $100,000. "We couldn't afford one, so we made it," he says. They got a rough prototype working before SXSW that year, so Pettis hopped on a plane, headed to Austin bars and began printing shot glasses with the device. He and his co-founders sold some 20 printers in just a few days. The latest model from Brooklyn-based MakerBot, the fourth-generation Replicator 2, costs $2,199 and is the size of a large toaster oven. It works by meticulously layering thin sheets of bioplastic material to create three-dimensional objects--a process made all the more mesmerizing under a lighting scheme reminiscent of a Virgin America cabin. MakerBot's range of industrial and personal printers has been a major catalyst in the hardware revolution, unlocking the ability for anyone to make things faster and more cheaply. Growth has been wild. In four years MakerBot has gone from three employees to more than 200; at press time the company had 50-plus job listings. There are some 20,000 printers in use (close to a quarter of total market share) and an estimated 115 million potential users globally (40 percent of orders are from outside the U.S.). NASA's Jet Propulsion Laboratory is the biggest customer, but the printers are also a boon to smaller operations like Robohand, creator of open-source prosthetic hands for children, and even to one geek dad who printed custom foot molds to help his kid pass the minimum height requirement at an amusement park. "We're not just a hardware company," Pettis says, noting that MakerBot also creates firmware and has a partnership with Autodesk, which makes software with rendering capabilities. And this fall's release of the Digitizer--which should cost roughly the same as the Replicator if Pettis' "washer-dryer" analogy is any indication--will further build out the company's position in the 3-D-printing ecosystem. And this is all just scratching the surface: "I think one day people will buy printers like they buy iPhones," he says. "If you put your MakerBot goggles on ... anything is possible. It's a frontier, and we're going to explore it." NanoSatisfi: This hardware startup aims to democratize space exploration by offering anyone a chance to rent space on its small, open-source satellites--at $250 a week--to conduct their own experiments. Making midday phone death a thing of the past, Everpurse converts handbags into mobile power stations. The smartphone-controlled Lockitron device fits over existing deadlocks, allowing users to lock and unlock their doors remotely from anywhere in the world. The Mauz device turns an iPhone into a motion-controlled, wireless optical mouse. Open-source parametric speaker Soundlazer transmits audio in a directed beam of sound for private listening without headphones. Attach hippih's tiny, wireless hipKey proximity and movement sensor to an object (even your child), pair it with your iPhone, and an alarm sounds if your valuables are moved from a designated radius. The transparent, flexible Touchfire iPad Keyboard fits over the tablet for faster and more accurate typing. LiquiGlide, a new material invented by MIT scientists, makes surfaces super-slippery, allowing for everything from pain-free ketchup squeezing to more efficiency in oil pipelines. Boil water in the PowerPot, a Kickstarter-funded thermoelectric generator, and it will provide enough juice to charge any device that uses a USB port. Corrections & Amplifications: An earlier version of this article misstated the number of estimated MakerBot potential users as the total estimated users. There are an estimated 115 million potential users globally.